America’s favorite roaster! Granite Ware Roasting Pans by Columbian Home Products have been a part of American meals for over 100 years. From everyday meals to holiday specialties, our roasters make your life easier with faster cooking times, even heating and simple clean up. The naturally non-stick surface is highly durable even allowing you to use your metal utensils during cooking. And what gets you back to your family or guests faster than putting these American-made pieces in the dishwasher? Who doesn’t remember growing up, waiting for the juicy Thanksgiving turkey to emerge from the oven in that dark, speckled oval roaster? Now you can own your very own. Or add to your collection. Bringing comfort food—just the way mom used to make it—to your own table. Ideally suited for a 12-pound bird or a 15-pound roast, this oval roaster boasts even heating and faster cooking times because of its unique construction. Our roasters have a strong carbon steel body perfect for absorbing and distributing heat evenly and quickly. They are energy efficient; the dark surface absorbs the oven’s energy, lowering cooking times. Porcelain is fused to the steel at 2,000 degrees Fahrenheit producing a non-porous, inert glass surface that is naturally non-stick. Porcelain can chip if dropped, however this does not reduce the effectiveness of the cookware. They are safe for metal utensils, easy to clean, and dishwasher safe! They are great for flavor! Since the glass surface is inert and will not absorb foods, the taste is not altered like it can be with other surfaces. There are no PTFE’s, PFOA’s or any other chemicals to change the taste, color or nutritional value of the food. 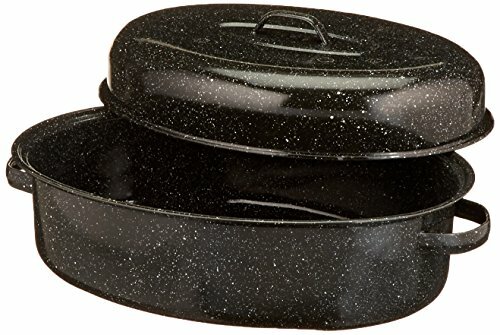 There is a Granite Ware roaster perfectly suited for any size meal, oven or food preparation method. Whether grilling, broiling, baking or roasting, we have a size and configuration to handle the task. Our roasters are equally at home in oven or on the grill. Lid works as a roaster too! It cooks faster and more evenly than other roasters, and is a better value than stainless steel roasters. The handles are built to hold the weight of the bird much better than a flimsy, disposable, aluminum foil tray. 17 15/16 x 12 ¼ x 7 5/8. Interior dimension with lid on is: 15 x 10 15/16 x 6 ¾.